Draplin Design Co.: DDC-022 "Mini Prints"
We made a series of “Mini Prints” for the DDC Pop-Up Store. Beautifully screen printed on durable “Way Bright” uncoated white paper. 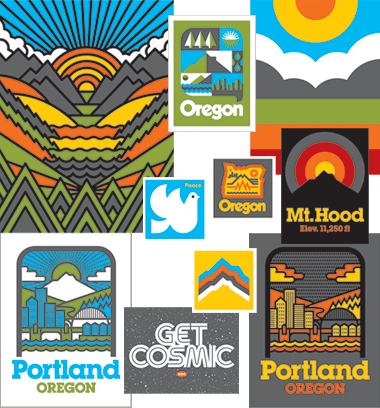 A handful of new designs, and a couple crowd favorites. Check that little “Space Shuttle Tribute!” mini print! That thing packs a punch. Big color, thick lines, durable materials and limited as hell. Snag a couple before they go! 01. Thick inks on durable paper. 03. Trimmed by our buddy Kevin. 04. Proudly printed by the champs by Seizure Palace. 07. Even the smallest of the bunch pack a colorful punch. 08. Very, very limited edition. 12”x16”, 6-color screen print, very limited edition. 9”x12”, 3-color screen print, very limited edition. 9”x12”, 4-color screen print, very limited edition. 9”x12”, 7-color screen print, very limited edition. 6”x8”, 2-color screen print, very limited edition. 6”x8”, 3-color screen print, very limited edition. 6”x8”, 5-color screen print, very limited edition. 4.5” x 4.5”, 3-color screen print, very limited edition. 4.5” x 4.5”, 4-color screen print, very limited edition.